So, it’s a New Year, a fresh start, new beginnings, perhaps? Perhaps you have started, or are about to start, and you are feeling excited? This often happens when you embark on something new. While it’s critical to be crystal clear with knowing what you want and having a clear vision, it’s even more important to understand where your motivation to achieve your vision stems from. While you want the drive to come from within, and not motivated by what anyone else wants for you, beware. There are two types of motivation, so it’s important you understand the drivers behind both. Your level of success is intrinsically linked to your motivation. Your ability to take action consistently on what is required to achieve your goals will be determined by how easy or hard it all feels. So, what are these two types of motivation? ‘Towards’ motivation is simply being motivated towards what you want, your desired results. ‘Away’ from motivation is being motivated away from what you don’t want; an impulse to leave behind your current state and situation you don’t want. I will explain with two examples. Firstly, let’s imagine two friends, Ann and Mary want to get fitter and slimmer. They both see a vision of a fit, lean and healthy person. One who wakes up feeling energised and inspired to get out exercising. Here is where the difference in motivation comes into play. Ann is motivated by this vision because she is sick and tired of feeling lethargic. She hates the feeling of her clothes being too tight. and no longer wants to be this way anymore. Her family are all overweight and she doesn’t want to end up like them. Mary, on the other hand, is motivated by how she will feel wearing her wedding dress on her special day. She is motivated and excited by the desired outcome. Firstly, how she will look and feel on her wedding day. Secondly, how proud she will feel when she has accomplished this goal. In the first example, Ann is ‘away’ from motivated and in the second, Mary is ‘towards’ motivated. Same vision but a huge difference in where their inner drive stems from. One is ‘away’ from the current state and one is ‘toward’ the desired state. This example works in every situation. Let’s take a look at a monetary goal. Imagine Tony and John both have the same vision of paying their bills three months in advance. Tony, however, is motivated by his anxiety that arises every time a bill arrives. He is sick of the constant worry and doesn’t want to be in debt any longer. John, on the other hand, is motivated by the excited feeling that this goal with bring. How free he will feel because the very act of paying in advance will mean he has saved more money. This equals more money to put toward his trip to Europe. A destination that has been on his bucket list for a while. While the actions of Tony and John could even consist of similar steps, it’s the motivation that matters. How to focus on your goals is, therefore, key to the success of your results. Why is this so important? It’s because, ‘away’ from motivation may help get you started, but it tends to diminish the further away you become from where you started. There’s less drive to keep going and it often feels much harder. When you are motivated ‘towards’ what you want, you are more likely to keep plugged in. You will find you feel more excited and as you get nearer, you feel more energised to keep going. You are more likely to celebrate your small wins which help you feel good and inspire you to keep going. Ultimately it will be easier to take the necessary actions towards what you want. To be consistent and stay on track to your goals. A far better way to how to focus on your goals. Interestingly, ‘away’ from motivation is precisely why so many diets fail. 90% of the motivation is generally ‘away’ from a current state, rather like the example of Ann above. ‘Away’ from feeling fat, overweight, lazy, uncomfortable, trapped, depressed, etc. To check your motivation on your goals, simply write down exactly why you want your goals. Be thorough as it is within your words where the keys to your motivation lie. As you read your words, notice where your mind takes you and how you feel. Is it ‘away’ from a current uncomfortable place more than’ towards’ an exciting opportunity or result? If it’s the first one, simply re-write your goals, ensuring your language, thoughts and feelings are all lined up in the right direction. Motivated ‘towards’ and by what you want. Read your goals daily and imagine stepping into your result, feeling excited and noticing all the opportunities that await. I guarantee if you check this critical step, you will be far more able to keep plugged into your goals. You will have discovered a critical key for how to focus on your goals and to achieve them. You may well double your chances of success. Here are a few more ways to keep focused on your goals. 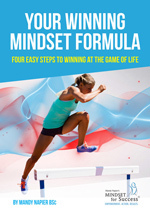 Mandy Napier is a Global Mindset & Performance Coach coaches people to P.E.R.F.O.R.M optimally and produce breakthrough results personally and professionally. Ultimately to tap into and harness their full potential. As an authentic, and inspirational coach and speaker, she partners with professionals and teams to create transformations and lasting results. To contact Mandy:- Email: info@mindsetforsuccess.com.au Web: www.mindsetforsuccess.com.au Subscribe to my YouTube Channel for weekly videos.